And finally, you will learn how to organize your DAW and workflow for optimum mixing and mastering back at home. 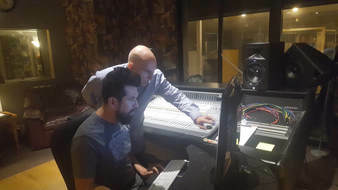 You will also learn how to get a Major Studio sound in your home studio only, if for any reason you cannot utilize the services of a Major Studio. The result of this year's Retreat will be a fully recorded album, a collaboration between HowToLicenseYourMusic.com founder Aaron Davison and Gary Gray. All participants are eligible for back-end royalties. Not to mention the Life-Changing Education & Networking opportunities! Upon receiving your submission, if we feel you're a good fit, we'll send you all the details on how to proceed. 2. A short one paragraph email describing yourself, your musical background, your goals and your accomplishments. Include in your email whether or not you can afford to travel to the retreat, stay at least one night in a hotel in Anaheim, CA (one hour south of Hollywood, near Disneyland), and pay for the retreat itself ($650US). The deadline for payment is October 28th, 2018. Be realistic and let us know if you can honestly make that deadline. If you pay by October 21st, your cost will be discounted to $550 USD. Everyone who is accepted will be notified by October 15th. There will also be a HUGE bonus package for everyone attending the event including dozens of courses and material to review in advance of this year's retreat.